We already talked about Nokia E7 and Nokia C7. Apart from these two smartphones one more phone Nokia C6-01 is announced at Nokia World 2010 event in London. Nokia C6-01 is the small and stylish smartphone with a 3.2-inch full touchscreen AMOLED display. 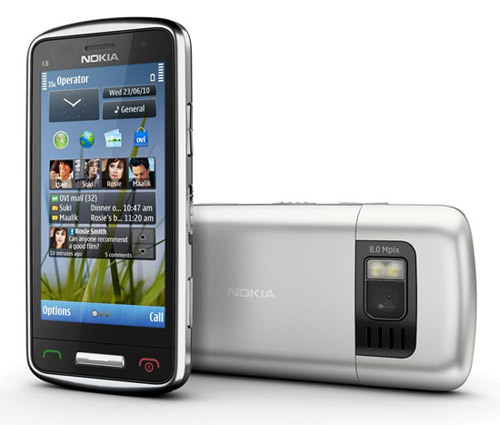 Nokia C6-01 is the upgraded version of Nokia C6 which is already available. It is based on Symbian^3 Operating System. It also has stunning stainless steel and glass design. The new Nokia C6-01 is expected to be priced at 260 EUR or 335 USD and it is expected to hit the stores before the end of the year. I think c6-01 doesn’t have auto-focus .. Yes C6-01 doesn’t have AF, it has been mentioned in Nokia Website that its of Fixed Focus.